LOVELIGHT CRYSTAL SOUND TEMPLE located at Third Eye Centre in Margate QLD has a sublime and truly divine collection of Crystal Bowls used for sound healing at the centre and also available for purchase . Operated by Judy & Paul there array of divine Alchemy Crystal bowls presented in a truly sacred space creating an experience of pure bliss, deep harmony within the body at a cellular level.. The Lovelight Crystal Temple hosts over 100 Crystal Bowls plus a superb range of Crystal infused Sacred Geometry clothing range. It's an old church converted into a healing centre, so it is pretty astonishing. Why Crystal Bowls are so profound…..
Our entire human body down to our very DNA is crystalline in structure, causing it to respond and resonate with the extraordinary frequencies associated with quartz crystal. The specific harmonic energy that emanates from crystal singing bowls is determined not only by the bowl size, note and shape but the combining of pure quartz with other elements including precious gems and minerals. Everything in the universe vibrates from the smallest molecule to the universe itself. As long as it is vibrating it is making some kind of sound. We may not perceive the sound, as it may be below or above the threshold of our hearing. The human ear can hear sound vibrations between 20 and 20,000 cycles per second, although we also perceive sound by skin and bone conduction, ingesting and consuming it with the whole body. Every cell in the human body is a sound resonator and has the capability of responding. The sounds of the bowls are absorbed primarily through the cells, and the spine, in conjunction with the chakra centres. The sound vibrations are carried through the body primarily by body fluids. Our bodies are made of approximately 80% water making them a perfect conduit for sound resonance. When in the presence of the sounds of the crystal bowls it allows your body to feel the overtones and the sound to integrate through the entire cellular structure. In this state we have the deepest experience of connecting with all there is, promoting the body into moving into a state of balance, and health. 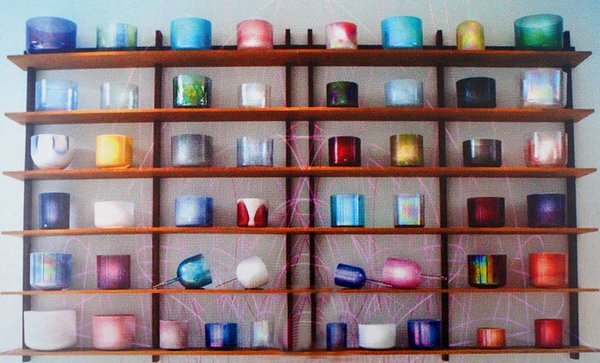 Where do our Crystal Bowls come from? 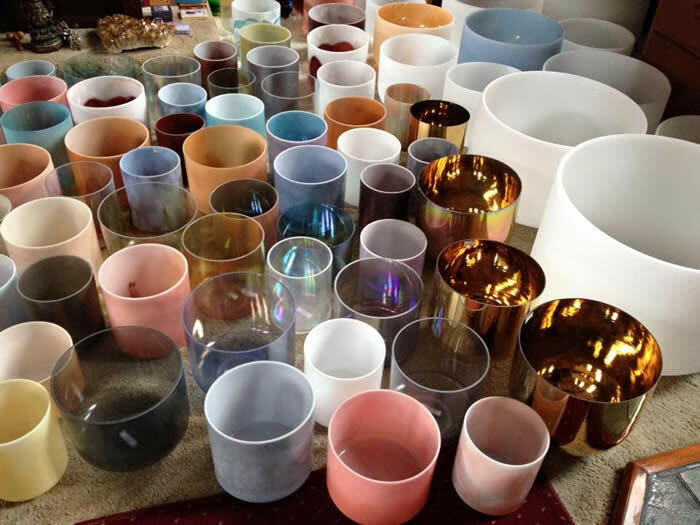 All our Crystal Bowls are from Crystal Tones….. Our Alchemy Series Crystal Singing Bowls are made in the USA with a unique, patented manufacturing process which is available only with Crystal Tones. This process makes the bowls strong and incredibly pure in tone. Crystal Tones are the Creator of the original Alchemy Series Crystal Singing Bowls, where the unique qualities and energies of the precious gemstones, metals and minerals are incorporated in the crystalline structure to form a radiant new entity which supports meditation, healing, spiritual growth and connection with our Higher Self.